This map of the Cascade Mountains in Washington highlights major interstate and state highways, cities and towns. Find scenic wilderness areas featuring North Cascades National Park, and points of interest including Mount St. Helens, Mt. Baker, Mt. 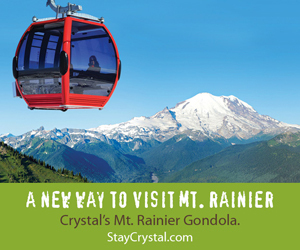 Adams, and ski areas such as Stevens Pass and Crystal Mountain. Click on any to city or town to find more information on accommodations and lodging, activities and outdoor recreation, attractions, food and beverage, visitor information and shopping venues. 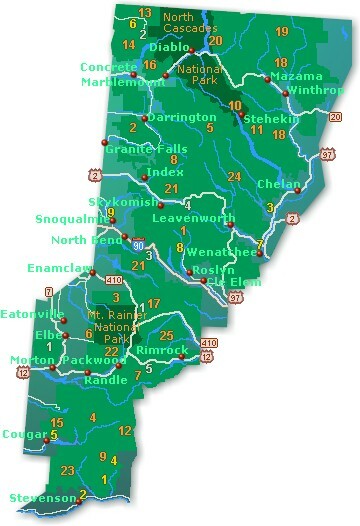 Utilize the left column to find travel articles for the Cascade region, information on mountain passes and more maps.